About 5 hours ago the AP posted that fast food workers are planning on walking out or not coming in this Thursday. Their campaign to get a livable raise began about a year ago. 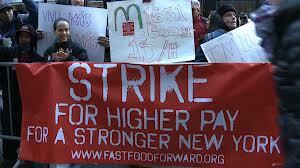 Although they know a 1 day walkout won’t hurt the fast food giants, they are hoping to send a powerful message. 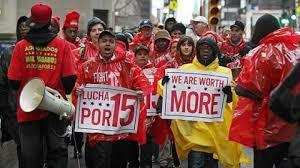 Right now most of these workers are earning minimum wage which is $7.25 an hour. President Obama has said he would support a Senate bill raising that to $10.10. The workers are requesting $15.00 per hour and although they don’t expect to get it they can not continue living on minimum wages. Organizers face an uphill battle in reshaping an industry that competes aggressively on low prices. McDonald’s Corp., Burger King Worldwide Inc. and Yum Brands Inc. face growing competition and slow growth in the weak economy. The organizers began planning this after they did a 60 city 1 day walk out this past summer. As of this writing they have no idea how many workers will actually participate. I wish them much success and encourage everyone reading this to not eat any fast food this Thursday,Dec. 5th.